This book, published c1860, serves as a beginning to some of the period entertainment of the mid-nineteenth century. 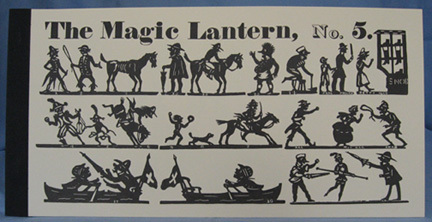 Magic lantern shows were quite popular, varying in complexity. This book contains figures to cut out and do shadow plays. You then attach the figures to slips of paper or strips of wood. Although it comes with two short scripts, the reader is invited to make his or her own script, fitting the dialogue to the characters available. While this set is numbered "5", leading you to suspect that there are other sets, those other sets haven't been published yet.